Most “liberals,” or progressives, will undoubtedly find Pelosi’s choice of words troublesome, since it suggests that she is perhaps unaware that no human being can be “illegal.” A person’s right to exist should not be an issue under any man-made laws anywhere. The terms “illegal immigrants,” “illegal aliens,” or “illegals” might seem appropriate to the Right Wing mindset. But even Ultra-Conservative Republican Marco Rubio distinguished between illegal acts and illegal persons when he used the phrase “living in the United States illegally.” [See the Washington Post , also dated May 23, 2013.] 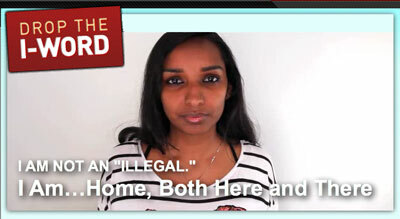 Colorlines  has been waging an ongoing campaign to get the media and the public in general to stop using the “I”-word. But, wait! Did Pelosi actually use that term, or is something else going on here? Speaker Pelosi also said, again according to The Hill, that “that has always been the Democratic position,” presumably referring again to the denial of health care coverage under Obamacare or Medicaid to “redeemed” undocumented immigrants. This in itself is a highly troubling issue. It means that the position of the Democratic Party, in concert with that of the Republican Party, is that people who emigrate to the U.S. without going through the INS (Immigration and Naturalization Service) turnstile, and become citizens under so-called immigration reform, are on their own when they get sick, even though their illness may be putting everyone else at risk. And they face this restriction, despite the fact that they are free to work and travel in the country, and do anything else all other people can do, whether they’re citizens by birth or have carefully navigated the INS cattle chute. However, putting aside Speaker Pelosi’s position as a Democrat willing to deny “redeemed” immigrants insurance coverage for their health care, let’s get back for a moment to the issue of the “I”-word (“illegal” or “illegals”) and try to make sure whether or not she actually used it. I did a little bit of research. Can we criticize Pelosi on two points, or only on one? A report in Talking Points Memo  about Pelosi’s statement used the term “unauthorized immigrants” in its header. This phrasing is still problematic, as it also aims to objectify human beings. But the journalist quotes Pelosi as saying, “Undocumented people will not have subsidies in the Affordable Care Act.” Why did the reporter change the adjective she used? How can a person in his or her status as a person be authorized or not authorized? This is a misuse of the word, as one can only be authorized or not authorized to do or not do an act. Saying that an undocumented immigrant is someone not authorized (by the state) to be in the country is very different from saying that the person himself or herself is an unauthorized person. One can thus conclude that specific reporters and editors of three varied media, The Hill, Talking Points Memo and CBS News, are determined to continue to give life to the “I”-word, regardless of what the person being interviewed or being reported about actually said. Therefore, I’m left with just one, but important, criticism of Speaker Pelosi and the Democratic Party in relation to immigration policy. I am strongly opposed to their position that “redeemed” immigrants should not have health care coverage, whether it’s Obamacare or Medicaid. Maybe even Medicare is also excluded. This is penny-wise/pound-foolish, politically-motivated policy. It lacks compassion for “redeemed” immigrants and puts in jeopardy the public health of both native-born and naturalized U.S. citizens and of visitors and tourists–in short, of every single human being in the country or even out of the country. The droplets from a sneeze do not discriminate and can spread from stairway railings in the subway to door handles at home. The short-sightedness of denying undocumented immigrants access to the Affordable Care Act even after they become citizens points up yet another reason for a nationwide system of single-payer health insurance. In such a system, everybody is in and nobody is out, including redeemed immigrants and visitors, whether they are authorized to be in the country or not. The position of the Green Party is that health care is a human right. Every person, regardless of his or her status, and no matter how one slices it, has a right to health care. This position alone makes sense from the standpoints of morality, public health, and sound economics. Cecile Lawrence, Ph.D., J.D., is a writer, event organizer and public speaker. Co-edited MOVEMENTS IN TIME: Revolution, Social Justice and Times of Change. Has articles published in scholarly journals. Lawrence was a Green Party NY candidate for U.S. Senate in 2010 and ran for county legislature in 2011. She has also published articles in Green Papers. Former marathon runner. Gardens, takes photos & videos of activist events. 1 Comment on "The “I”- Word, the Media and Health Care Reform"
Undocumented immigrants to the U.S. should be entitled to Medicaid or ACA under the same guidelines as U.S. citizens. If you are not poor enough, or barely making it, you do not qualify for Medicaid. The guidelines are based solely on income, without regard to expenses for housing, food and clothing. We should be putting the same effort into single-payer, universal healthcare as we do the issue of immigration.